I used to watch The Little Mermaid every day when it first came out on VHS. I was obsessed, and my mom even made me a fantastic Little Mermaid costume that got many uses. The only thing the costume couldn’t do? Go in water. 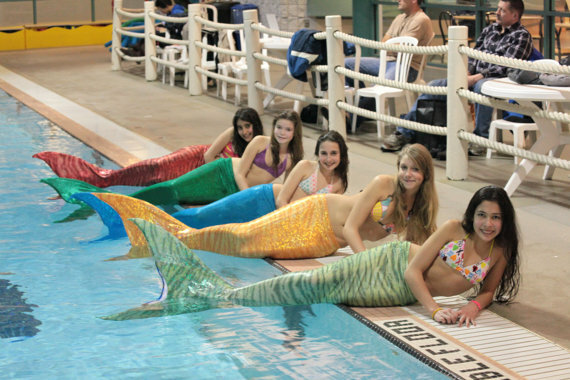 These swimmable mermaid tails would be the way to go if I ever wanted to remake my old costume. And now I really want to. Etsy seller Monikanaumann makes each tail to fit custom measurements, and they’re made out of top of the line swim fabric. It’s perfect for your next pool party! Swimmable Mermaid Tails, $250 at Etsy. Little mermaid cosplays at cons? Monika is a great seamstress and a fantastic business woman! She is so easy to work with and will go out of her way to get you exactly what you want! Her Mermaid tails are awesome and work great! What I find so endearing about her is that she cares! Not too many people do anymore. Your child’s dreams will come true with one of Monika’s Mermaid tails!